Marketers today have great visibility into their businesses – their funnels, websites, and roadmaps – and many tools and data to evaluate those internal workings. But most marketers don’t have great external visibility – understanding what’s happening outside the four walls of their businesses to make strategic decisions that help them win. In this session, we will dive into the wealth of information available on a marketer’s external environment and how to leverage that data to win across every area of marketing. Understand how to build out a test road map based on proven prioritization tactics. Gain deep insights from all test outcomes, not just winning tests: Learn how to benefit from losses and build on the wins. Spending your ad budget left and right and still aren’t actually getting the engagement you want? Having trouble actually connecting with your demographic, let alone getting them to convert? This session explores real life examples of ad copy techniques that actually work and teach you how to convert any audience based on the ad copy you use. In this jam-packed presentation, Greg’s going to cover all the important aspects of Local SEO in 2019. After walking through the important takeaways from the recently released Local Search Ranking Factors, he’ll share detailed tips on how to optimize each important signal area. Learn how to write localized content, how to build powerful local links, how to handle citations, and reputation management and reviews. And, since your Google My Business profile is basically your new home page, you’ll learn exactly how to optimize every feature, with special concentration on Google Questions & Answers and Google Posts. Email is a marketing workhorse that continues to be in its renaissance from a creativity and experience perspective. On it’s own it’s great, but email is really best in a connected experience across channels. This session will dive into email and how it connects with other channels to improve the customer journey. We will finish with a case study on how email and messaging are used in conjunction with user activity data to drive value. Join Amy Rosenberg and Carri Bugbee to learn how PR overlaps with SEO and social media marketing. Amy will explain SEO-oriented PR, offering tips for the most effective way to garner links from the news to your owned media in order to build authority for your domains. Carri will discuss how to approach organic social media from a PR perspective, how to prepare for online crises, the state of influencer marketing, and digital PR tools you should consider. Then the duo will answer your questions related to SEO-PR and Social-PR. Find a happy medium between automation and human touch in 2019. Adopt parts of Google’s tools to reach your performance goals in search. We’ll learn to use language ticks, device behavior and audience tools to deliver the perfect message to your audience. We’ll also learn to leverage Google’s new suite of “smart” tools to be an ally rather than an enemy. JR will demonstrate how his company has set up automated notebooks that pull GSC query data, make probability assumptions on what queries are sending traffic, and automate analysis of a site’s internal link structure. In this technical session, he’ll present the underlying mechanics of this automation, then provide attendees with the notebooks to take away and try them out for themselves. If you’re a technical SEO, this is a great session to level up automation of common tasks and analysis. Two Enterprise SEO experts share their stories about how to scale SEO strategies through testing, experimentation, and continual learning. They share ideas on how to set up a strong foundation for your organization by baking SEO processes into your culture and company’s priorities. Learn how to conduct experiments at a large scale, how to measure success and how to share the information with your team. This session will teach the audience how to plan out strategic multi-channel campaigns to drive prospects all the way through the customer journey. We’re also going to cover linding audience-specific, channel-adaptive messaging, and deep psychographic audience research to drive performance on Facebook. Pay Per Click Account Structures can affect both paid search performance as well as management and optimization. Join us for a presentation takes a deep look into how the team at WebRanking.com builds high performing and deeply segmented PPC campaigns. Drawn from concrete examples and requests for help in the Local Search Forum, Google My Business Product Expert Joy Hawkins will discuss GMB’s thorniest issues and how you can fix them. This interactive session will offer plenty of live Q&A time to get Joy’s advice on troubleshooting your own Google My Business questions! Ask 10 different marketers what “Integrated” means to them and you’re likely to get 10 unique answers. As with other buzzy-type words (think “big data” and “influencer marketing”), “Integrated” applied to marketing essentially means whatever some smarty pants marketer says it means! Learn how integrated marketing means melding creative, search, psychographics, social, paid, organic, PR, influencers, offline, and data therefrom to form a cohesive whole. From first branded impression to closing the cost-per-action-deal, make marketing a unified process, limiting silos, all on the same page. • Generate more brand keywords searches (the holy grail) via integration This session offers an actionable bag of tricks, mined from case studies by some of the coolest integrated agencies in the world. Be there for a data dump from 11X US Search Awards winner Aimclear®, including the last three consecutive Best Integrate Agency. The documentation about Mobile-First Indexing is quite straight-forward, BUT the impact of its launch is not. If you compare the mobile SERPs before and after it has launched, you will see major differences that are not represented in your data. This talk will go beyond the Google documentation, and talk about the implications of the change. Google has been building out the Knowledge Graph, position-zero and other ‘hosted inclusions’ and these things may be impacting your SEO results in ways that don’t show up in your analytics. Attend this session to learn more about how Mobile-First Indexing will impact your day-to-day SEO strategy & tactics, and how you can adjust to protect against the things you might be missing. Technical SEO is the roots of a site. With a strong technical foundation, search engines will be able to crawl, index, render, and interpret webmasters signals. Alexis will present a framework for diagnosing technical issues. During a shifting economy it’s crucial to align your digital marketing efforts with your larger marketing channel and business goals. Ensuring this alignment not only allows you to demonstrate the value of your marketing efforts internally, but also drives greater results during challenging market cycles. By the end of this session, you will have the tools and strategies you need to: understand and measure the impact of your marketing channels; align those channels with your business’s goals; and effectively communicate your results to key stakeholders. During this panel, Kane Jamison (Founder & Managing Director, Content Harmony) and Tushar Prabhu (Director of Organic Marketing, Position2) walk you through the latest in content marketing and the triggers you need to be looking for to make sure your content gets ranked and gets found. Come ready with your questions as this is sure to be a lively conversation. This will be a deep dive into the importance of search intent and the process of implementation of the correct structured data on your site, with plenty of time for questions. François has 15 years experience in SEO, and has a deep technical background, so plan on taking a lot of notes! We have all the data in the world. Analytics! Reviews! Surveys! Heatmaps! Now… what the heck are we going to do with it? Information overload in marketing is a real problem, and you need to figure out where best to spend your limited resources. In this presentation, Dana will walk you through building a customer experience framework for your organization, including how to tie together separate data points into a cohesive picture of your customers. You’ll learn how to reduce the background noise and build a plan on how to improve customer experience. Dana DiTomaso, Kick Point Inc. Web marketing certainly isn’t going away, but four forces are combining to radically change how we’ve approached our work the last ten years vs. how we’ll have to in the decade ahead. Google’s removal of SEO opportunity, Facebook ending referral traffic, falling ad impact and rising competition spell an end to the “best practices” of the 2010s. In this presentation, Rand will look onto the horizon to see what new tactics and strategies are emerging from the ashes, and what we’ll need to know to stand out in the years ahead. 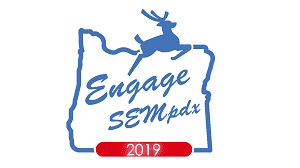 Instead of going home after the conference, the SEMpdx board and conference speakers are inviting you to join them in a pub crawl of Portland’s best brewpubs. We’ll all meet at the back of the Governor Ballroom (4th floor) by 4pm and head out. The first round is on SEMpdx! We’ll be visiting Von Ebert Brewing, Rogue Brewing, The Big Legrowlski, and Botanist Bar. 2020 Tix on Sale Now!